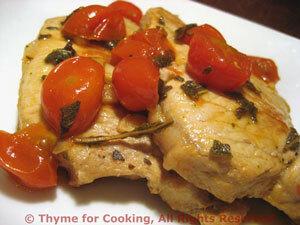 Thyme for Cooking Dinner tonight: Pork Chops with Tomato and Sage. I just can't seem to give up the last bits of summer this year.... We haven't had a frost so there is still sage in the garden and a few cherry tomatoes. I use 'Uncle Ben's' which is all I can get and it is quick cooking. 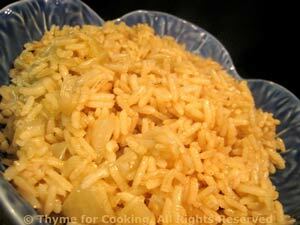 It looks like brown Basmati and cooks in 15 minutes. 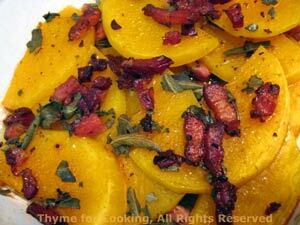 A bit of fried onion adds sweetness, making the rice a little more interesting than normal. Heat oil in small saucepan. Add rice and sauté another 2 minutes. Add stock, cover and cook rice according to package instructions.